John says the location is just at the end of a station; the platform end is just in view in one shot, and with a fairly large box. The stock involved includes 6-wheel Brake Third no. 7504 and motor set no. 11. The motor set is in LMS livery so the date is circa 1923-4. John suspects this was possibly a shunting accident, but where was it? There is a further view here. It could be Llandudno. The lines split outside the box into the five platforms plus an engine release road between platforms three and four. The shunt roads to 'Cae Mawr' (translates into 'Big Field' - the carriage sidings on the Down side) from platforms four and five ran to the rear of the box. The stock would be standing on platform three (the station roof seems about right in the background), with the conflicting movement heading for the engine release road between platforms three and four. On the other hand, I could be wrong! Could this be the accident at Llandudno on October 12th 1925, when a motor train was propelled out of the station by a 2-4-2T, passing a red signal, and hitting an incoming train headed by a Coal Tank? The report is on the Railway Archive website. I included some of the details of this in the 'Bashers' book, in which I now realise I mistakenly entitled the piece as Llandudno Junction, when it should have been Llandudno! Perhaps someone may have other references to establish that the signal box/platform end and other surrounding landmarks are those at Llandudno. Brilliant - location, date, and all details sorted, and so quickly. Nice work!. Chester to Holyhead Railway by V.R. Anderson & G.K. Fox contains a photograph (plate 177) showing Llandudno no. 2 box. This looks exactly like the box seen here; a small dark item hanging just below the eaves (a bell? a telephone wire insulator?) can be seen in both. The background houses (in King's Road) look similar. A plan (fig. 81) in the same book shows the trackwork as in the mystery photo, and the end of platform 3 seen in John Alsop's other view. Brake Third no. 7504 was not a six-wheeler. It was in fact a 28ft 0in two-compartment brake-third, a four-wheeler of D.364, originally built in 1894 as T.1801 for a Birmingham District Set. The four-wheelers were displaced from this work by new bogie stock in 1907-8, but were still extant at the grouping at which time they were included in a variety of sets located at the remoter outposts of the LNWR, especially Swansea. The badly-damaged carriage in the first photo has five torpedo vents on the roof which indicates a five-compartment vehicle, presumably a 28ft 0in third to D.300. It would not have survived the accident, but as the records for this period are virtually non-existent it is not possible to identify it. The accident report referred to mentions three six-wheelers and two four-wheelers. It was the four-wheelers in the rear which suffered the most damage. That is consistent with the photo. Brake Third no. 7501 is the carriage at the rear behind the heavily-damaged coach. Note that all these were said to be electrically lit. It would be very likely that the 9.20 Llandudno Junction to Llandudno train, conveying school children, would have been made up of old carriages such as these. From 1920�27 Third Motor Set 11 was made up of LMS nos. 5345 of M.62 and 7984 of M.73. Both were conversions from D.289 and both were repaired after the accident. It is hard to identify the signal cabin, but note that it has a bell to announce the arrival of trains. This feature was found more at country stations where the signal cabin was on or by the platforms. Llandudno no. 2 was not very close to the platforms (say 50 yards), and especially the station buildings, and certainly did not have a bell in BR days. On the other hand the track layout and signal cabin position indeed looks like Llandudno no. 2, and apart from the bell there is no reason to suppose that the cabin is not Llandudno no. 2. The photo in the book referred to does indeed show a bell, which had disappeared by the time I took my photo of Llandudno No.2 in 1970 or so. So I withdraw my comments! Well spotted, Pete! All the details match perfectly between the photo and the accident report, and various plans and signalling diagrams. I am particularly interested in Motor Set 11 forming the 9.20. 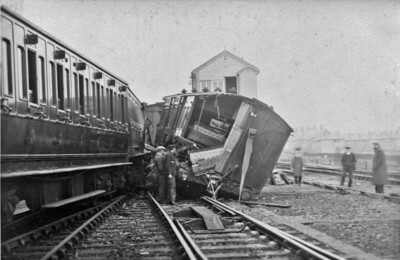 This accident was in the last few years of LNWR-style motor train working, as all services were treated to a thorough upgrade by the LMS in the period 1927-32 with all vehicles converted to VCR, new types of engine fitted and some new coaches. The driving coach LMS no. 7984 was previously LNWR no. 7683 and was the only one of its type on LNWR Diagram M73 until the LMS added another. It seems unusual in only having one driver's window in the end rather than the usual three, thus preserving two thirds of the LNWR brake end profile. Incidentally, I believe it was converted from a D342 Brake Third, not a D289 Third. I suspect it was a late conversion, but the only information I have is that it was part of this set by 1920. No. 5345 was former LNWR no. 698, one of 17 similar simple conversions of D289 Thirds and motor fitted probably after 1916, and certainly after 1912. I am still working out when and why all of these M62/M63 vehicles were fitted. Engine no. 760 was a 4ft 6in 2-4-2T or Motor Tank, which class operated most LNWR motor services until the 1920s. No. 760 was motor fitted in Dec 1911 or in 1912 and originally allocated to Willesden. It was at Longsight in 1917 and 1919, but I cannot say when it was transferred to Llandudno Junction. It was designated for Walsall in 1926 but this may not have been put into practice. Its LMS number 6579 was applied in May 1928. It is also interesting to note as stated in the accident report that these motor services were often worked by four coaches with the engine in the middle (as with the Earls Court service of 1911-14 and the Birmingham District services of 1912-16). The two coaches pictured gave all-Third accommodation, but maybe the other two would have included a composite. I would like to add a correction to Reg Instone's commentary. The two vehicles on M.73 (nos. 7683 and 7767) were both converted in June 1912 under W/O 191 for Willesden-Harrow no.2 set. In 1919 no. 7863 was in Ebbw Vale Set 2 (running solo), then in TMS 11 with T.1049 from 1921 -28 (at least). Drawing 6/453 dated 7/17 shows alterations to no. 7863 for the Ebbw Vale service. No. 7767 was in Brynmawr set with T.888 of M.62. The set was re-designated TMS 8 in 1920, and existed as such from 1920 to 1927 (at least). No. 7683 was built in 1/99 as Brake Composite (2nd/3rd) no.762 for Lime Street to Bootle no.1 set. No. 7767 was built in 5/02 as Brake Composite no. 1709 (2nd/3rd) for Lime Street, Garston and Bootle Set 1. They became Brake Thirds at the abolition of Second Class. Strictly these were not on D.342 as they were converted to motor before the 1915 Diagram Book was issued. In fact they were not completely identical, as no. 7683 was built on a steel channel underframe, while the later coach was built on a bulb-iron underframe. But as Reg says, they did originate as brake ends.